Recommended by professional soccer players, SenseBall is especially aimed at young players between 6 and 20 years of age. Practising with SenseBall allows improving their soccer skills and becoming two-footed. SenseBall also improves the performance of all sportspeople for whom high-speed and precision of leg movements are essential (basketball, tennis, skiing, handball...). 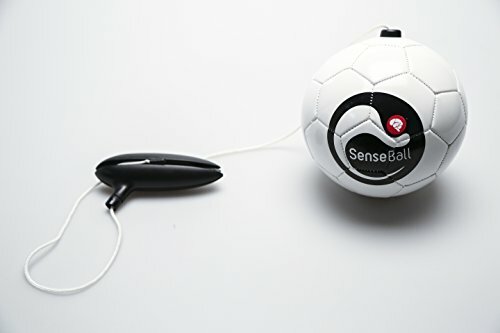 The principle of SenseBall is based on the concept of bilateral activity. Thanks to its specific design, 50 exercise videos, mobile app and didactical program online, a player practising SenseBall will make an average of 500,000 touches of the ball in a season. In a training session, a player uses his left foot as many times as his right and moves through space in a balanced way left/right and backwards/forwards. Whether done individually or in a group (and so rhythmically), the soccer training ball SenseBall enables developing specific soccer skills, reacting quicker and gaining in rhythm. Get your SenseBall now and become a better soccer player! The purchase of SenseBall includes an access code to 50 exercise videos, a mobile application, a complete didactical program and 2 video conferences online. SenseBall is the soccer training ball developed by CogiTraining, the revolutionary soccer training method implemented in soccer clubs and Federations around the world such as the Belgian FA, AC Milan, RSC Anderlecht, AS Monaco and FC Metz. BECOME A TWO-FOOTED PLAYER. Acquire the essential skills of modern soccer: Perfect ball control through repetition. Better accuracy guiding and touching the ball. Faster and more precise passing. Speed up decision-making. Playing quickly and accurately in crowded areas. Correct body posture. Prevents the development of postural problems. Fewer chronic injuries. Contributes to an effective rehabilitation. Improved concentration, perception, coordination and synchronisation. Improved group training. React quicker, gain in rhythm and become a better soccer player! If you have any questions about this product by SenseBall, contact us by completing and submitting the form below. If you are looking for a specif part number, please include it with your message.